Walsall left-back Luke Leahy has spoken to the press on the eve of what could be his 100th club appearance and called upon everyone, the team, staff, and fans to stick together as they look to return to winning ways and move out of the relegation zone. 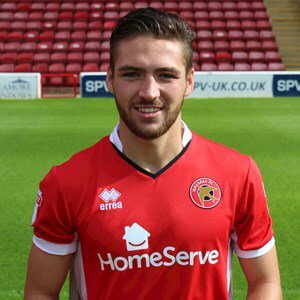 Coventry-born Leahy, who joined the Saddlers from Scottish side Falkirk in the summer of 2017, believes that the sheer number of teams also struggling towards the foot of the table could serve as a positive as it will only take a few favourable results to see the Saddlers into safety. Luke, who was speaking via the Express & Star, said; "It’ll be 100 games for me if I am selected tomorrow – that is brilliant for me. But the position we are in, we have six games left and there isn’t any room for error at the moment. It is very tight down there. "There are a lot of teams fighting to stay in the league and we have to take every chance possible now. It is still in our own hands because we have got to play five of the six teams that are around us. I’m confident by giving our all in these six games we will get out of it." Leahy is no stranger to relegation battles in a Saddlers shirt as they were in a similar position last season and went on to get out of trouble, and with the pressure ramped up again, the 26-year-old believes the experience of last season will help the team this time around. Luke continued; "You can feel the tension in the stadiums that you go to which is bound to happen but you have got to ignore that and play your own game. Every team will be feeling it and every player who is looking at the league table will be feeling it as well. "But we definitely have the characters needed to get out of it. We did it last season and I am very confident that we will do it again this season. We have been in this situation before and we know how to deal with it. Positive energy is the main thing. "You need to come into training with a smile on your face and we need everyone to stick together."